The moment I finished reading Arjuna, the mesmerizing Green Eye on the cover page of The Wordkeepers caught my attention. It is a strange coincidence that I picked up yet another mythical book after reading Arjuna and Thundergod in quick succession. Though I was quite tempted by the attractive Blood Red Sari as well, but in the end decided to go with my first choice. 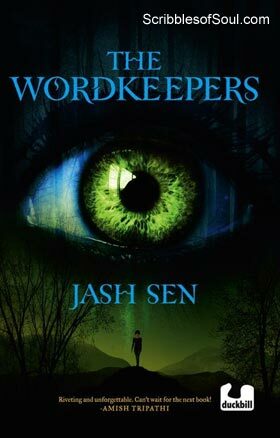 And, thus Wordkeepers by Jash Sen became my current read. However, as soon as I began reading the Prologue, a strong feeling of deja vu struck me. The Wordkeepers begins almost where Arjuna ended, with the massacre of Pandavas’ kin by deadly Ashwathama. It is indeed strange that just a few days before, I did not know anything about Ashwathama’s brutal killing and his cursed immortality. And, now, as if to reaffirm the unbelievable story, I was told about it once again by Jash Sen. The present book begins with the tale of Chiranjivi (Immortal) Ashwathama, who is doomed to roam the mortal world till the end of Kalyug, when Kalki avatar would destroy the evil and begin a new era of Truth (Satyug). If you have read my previous review, you must be sure of my child like fascination with Indian Mythology and anything even remotely related to Mahabharat, so needless to say, I was super duper excited to read yet another fantastic mythical tale. But, as they say, never judge a book by its cover, so should one never take the prologue as a correct measure of the actual story. I realized this with a bang as the story began with an italic note by none other than Ravana’s brother, Vibhishana. As I read this part, I was totally confused. Wasn’t Vibhishana a part of Ramayan, which was written in Treta Yug, much before Krishna, Arjuna and Ashwathama were even born. So, how come in the Kaliyuga, a tale is being spun featuring Vibhishana as the sutradhar. Little did I know that this was not the first shock I am going to receive at the deft hands of Jash Sen. In her debut novel, she is on fire and kept on singing me with cleverly plotted twists. In the very next chapter, she performed an expert somersault and began the story in 2028! Oh, now I began to understand her trick, she is going to tell me a futuristic mythical story, not based on the actual facts (at least as per the written scriptures) but based on her vivid imagination. It is true that in Mahabharata itself, Krishna cleared his intentions to revisit the earth in the form of yet another avatar, kill the predominant sick mentality of Kaliyuga and be known as Lord Kalki. But, as is common with all prophecies, the timing of his birth and background are obscure, and this legend is taken as the basis by Jash Sen, to write a story teeming with villains and shady creatures. Apparently, in 2028, in the city of Bangalore, lives a fourteen year old girl called Anya Sharma. Her parents seem well settled and she is living in comfort. But, as the story began, something suspicious prickles her conscience. She realizes with a shock that her mother has proceeded to an office tour without meeting her and has even left her locket at home (a pendant containing a big red stone, which till now her mother never took off her neck). Anya smells something amiss and begins to eye her surroundings keenly. And, then to her utter shock, she realizes that even her father is behaving a little odd. One thing leads to another, and in a space of few hours, Anya discovers that her parents have disappeared and have been replaced with shape shifters, who sound and look just like them, but are in reality mysterious creatures out to harm Anya. Too much was happening too fast, not just for me, but for Anya as well, who was left alone to fend for herself and come on terms with cruel destiny. I believe the biggest lure of a mystery is that it is incomprehensible to average human mind and as I continued reading Wordkeeper, I realized this as a hard hitting truth. Who is Anya? Who has abducted her parents? Where do Ashwathama and Vibhishana of bygone era fit in this supposedly futuristic story? These were some of the questions that kept bombarding me with renewed intensity, as I kept reading Wordkeepers. I do not wish to divulge anymore as it would spoil your fun in enjoying a unique twisted form of a well known prophecy. But, rest assured, the story is quite intriguing. Many people are eagerly waiting for the birth of Kalki Avatar, which would supposedly rid the world of evil Kaliyuga and it is increasingly becoming a part of popular spiritual and religious discourses, and, Jash Sen in her own way has given a molded version of how the prophecy would finally act out. However, it is one thing to believe in the past stories and dive again and again into the vast pool of Indian mythology, but it is hard to convince ourselves of the possible existence of a future God. And, though, personally I can not totally agree with the future events Jash Sen has presented in her book, yet the author does deserve praise for thinking out of the box. The book is written for young adults, so the protagonists are teenagers. The narration is simple yet addictive and execution quite comprehensive. Even the names used in the narrative are actually a part of the legend. So, I would advise the readers to do a little background check on the net. I made the mistake of taking these names for granted and thus missed their connection for quite some time. I was unaware that Dhoomawati and Nirriti are both Goddesses, and their roles in the novel are quite similar to their prevalent characters. Kali are not just names, but the very embodiment of dominant vices of human mind. So, in subtle ways, the narrative does have a deep meaning, which became clearer to me as I delve into the philosophical part, leaving aside the doubtful snide. Initially skeptical of the supposed background of Anya and Bilal, I had struggled to disassociate from the religious implications. But, at last the curious reader in me too over, and I was able to enjoy the book as a futuristic fantasy by a creative writer. And, I enjoyed the story till it lasted. However, I was baffled by the end. I was left alone at the climax with a strange eye keeping a watch on sky and I felt like the pitiful Rakhi crying out aloud “Mere Karan Arjun ayenge” and it was only then I noticed that the current book is a part of trilogy. The impulsive reader in me was a bit annoyed. But, next two books in the series are promised to be released soon and hopefully I would read them in due time. Till then, let me move on to on my next read Red Blood Sari by Ashok Banker. Oh, I can hardly wait!